With five weeks left before the mid-term elections, Barack Obama sat down for a long must-read interview with Rolling Stone – the first time the President has done so for the magazine since winning the White House in 2008. 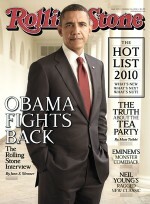 The political reasons were obvious: Rolling Stone caters to a young, hip, progressive crowd disillusioned with Obama – and the President must fire up the base for November. But while addressing this “enthusiasm gap,” Obama’s response showed how he fails to appreciate or understand the level of anger at his Administration. The “professional left,” as Obama’s press secretary once called them, is not disillusioned because we’re ideologues and purists who expected everything to happen – we knew it wouldn’t be easy, but we expected Obama to put up more of a fight than he has. For the White House to infantilize our anger just insults our intelligence. Bill Clinton could have basically made that statement in 1996, after he had betrayed the Left over Don’t Ask Don’t Tell, NAFTA, Welfare Repeal, DOMA and scores of other atrocities. It’s the standard “Democrats are diverse” canard that leaves progressives crumbs, while the Party’s corporate wing laughs all the way to the Bank. We expected that from President Hillary Clinton, but Obama – a transformative candidate who assembled a massive grassroots coalition – was supposed to offer something different. But I want to zero in on the part where Obama says his election made the Democrats a “bigger tent” – a wider coalition that makes it harder to keep together when you govern. It’s true that Obama won many Republican and independent voters in the last election, but they knew how progressive he was going to be. Obama did not win Indiana because they expected him to govern like Evan Bayh. George Bush had failed them, and these “red-state voters” were fully ready to accept a President called Barack Hussein Obama. The statement also ignores that 2006 and 2008 expanded the Democratic coalition by bringing out an unprecedented number of Latino voters – who, if anything, are furious that he has not been progressive enough on immigration. In fact, 2006 was an historic year because for the first time in 50 years the “non-Southern” party had a majority in Congress. 2006 was the demographic start of a new progressive era – one that Obama and much of the Democratic establishment in Washington has failed to appreciate. Some of it, also, has to do with — and I joke about it — that there’s a turn of mind among Democrats and progressives where a lot of times we see the glass as half-empty. It’s like, “Well, gosh, we’ve got this historic health care legislation that we’ve been trying to get for 100 years, but it didn’t have every bell and whistle that we wanted right now, so let’s focus on what we didn’t get instead of what we got.” That self-critical element of the progressive mind is probably a healthy thing, but it can also be debilitating. This is far from the first time the White House lauds his health care bill as “historic.” Recently, Joe Biden chastised the Left for being upset that we didn’t get a public option. What angers progressives is not so much what was in the final bill – but rather how we got the final product. When it was the extortion of Joe Lieberman that killed the public option (or as some have speculated, Obama killed it quietly behind closed doors), it was clear the White House did not consider progressives an equal partner. Many of us are in fact very pragmatic, and some of us could under the right circumstances have accepted a compromise bill that did not include a public option. But not after the entire process revealed how weak and insignificant we are in the game. Obama’s triangulation strategy of courting dishonest Republicans like Olympia Snowe, or allowing the most anti-progressive Democrats like Blanche Lincoln and Ben Nelson to openly collude with Republicans and filibuster a public option, resulted in an unwinnable outcome. We elected Barack Obama – not these Senators – to get change we believe in. Even worse, it has created an awful precedent where progressives are always sidelined. I keep in my pocket a checklist of the promises I made during the campaign, and here I am, halfway through my first term, and we’ve probably accomplished 70 percent of the things that we said we were going to do — and by the way, I’ve got two years left to finish the rest of the list, at minimum. So I think that it is very important for Democrats to take pride in what we’ve accomplished. It would have been great if the Rolling Stone reporters had asked Obama to take the checklist out of his pocket and show it to them, because I have a hard time seeing how we got 70% of his campaign promises done. And I imagine most readers would too. Employee Free Choice Act? Not yet. Comprehensive immigration reform? Forget it. Climate change reform? Not even the BP oil spill made it possible. Repeal Don’t Ask Don’t Tell? We all know what happened last week. Repeal DOMA? Ha!! Stop the Bush tax cuts for the wealthy? Unlikely. Obama couldn’t even get a job for Elizabeth Warren without making it a recess appointment, so even the appointments are sketchy. It is inexcusable for any Democrat or progressive right now to stand on the sidelines in this midterm election. There may be complaints about us not having gotten certain things done, not fast enough, making certain legislative compromises. But right now, we’ve got a choice between a Republican Party that has moved to the right of George Bush and is looking to lock in the same policies that got us into these disasters in the first place, versus an administration that, with some admitted warts, has been the most successful administration in a generation in moving progressive agendas forward. On that point, I actually agree with Obama. For Democrats to lose Congress this year would be nothing short of disastrous, as it will open the floodgates for Teabaggers hell-bent on repealing the 20th Century. And you can bet that Republicans will never allow procedural niceties like “60 votes in the Senate” stop them from wreaking havoc. But the effectiveness of that point was undermined by the President’s whole interview. When Republicans are in power, they encourage their base to be outraged and dissatisfied – while they urge them to stay engaged to expand their majorities and push them harder. With Democrats, they tell their base to “sit down and shut up” and to be happy about all we’ve accomplished. And then they scare us about Sarah Palin and the latest stupid thing that Newt Gingrich said, just to keep us on edge while we walk precincts for the Party.